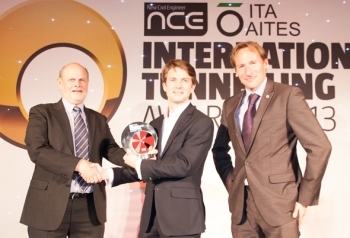 On Tuesday 26th November, the winners of the 2013 NCE International Tunnelling Awards were announced at the prestigious Grosvenor House Hotel in London, to the largest ever tunnelling awards audience which included some of the biggest names in the industry. MineARC Systems picked up the prize for Safety Initiative of the Year, accepted on the night by MineARC European Business Development Manager, Thomas Horton. The annual awards are organised by the New Civil Engineer and Ground Engineering magazines in association with the International Tunnelling and Underground Space Association (ITA-AITES), and celebrate the most innovative and successful projects, companies and individuals from across the global tunnelling industry. The awards were hosted by New Civil Engineer Interim Editor, Mark Hansford and included a keynote speech from Douglas Oakervee CBE, Chairman of HS2, in front of an audience of the key players from across five continents of the global industry. During the last 18 months the tunnelling industry has witnessed the introduction of new legislation such as the current British Standard BS6164:2011 and the impending ITA-AITES ‘Guidelines for the provision of refuge chambers in tunnels under construction’. Within the tunneling industry, a range of incidents can potentially occur to put lives at risk; including fires, roof collapses and the release of smoke and other forms of toxic gas. In these types of scenarios, where escape is no longer safe nor practical, emergency refuge is designed to provide a safe and secure ‘go-to’ area for personnel to gather and await extraction. 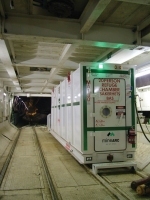 MineARC's longstanding specialisation in emergency refuge chambers for the mining industry led to our introduction into the tunnelling industry in 2003; engineering our first tunnelling refuge chamber for the Dublin port project in Ireland. The following years saw numerous projects around the world and an ever increasing degree of manufacturing specialisation and customisation for the tunnelling industry. Together with our partners, and in consultation with the wider tunnelling community, MineARC has assisted with the introduction of global legislation covering refuge chambers in tunnels.